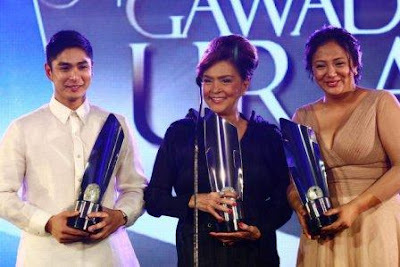 It seems that there is a reunion of the three main cast of the hit teleserye "Tayong Dalawa" as Ramon, Marlyn, and Lola Gets got together in the stage to receive their respective awards! 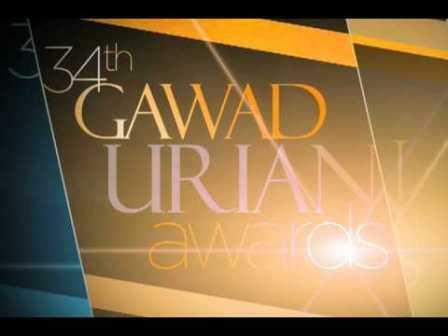 Coco Martin, Cherry Pie Picahe, and Gina Pareño emerged as the three big winners in the recently concluded 34TH Gawad Urian Awards as they received the "Aktor ng Dekada" and "Akress ng Dekada" awards respectively! Meanwhile the Cebuano Indie Film “Ang Damgo ni Eleuteria” got the "Best Picture Awards". The film also won in three other categories namely "Best Cinematography", "Best Music" and "Best Director" for Remton Siega Zuasola. “Tuhog” (2000), “Batang Westside” (2001), “Babae Sa Breakwater” (2003), “Magnifico” (2003), “Ebolusyon ng Isang Pamilyang Pilipino” (2004), “Ang Pagdadalaga Ni Maximo Oliveros” (2005), “Kubrador” (2006), “Serbis” (2008), “Kinatay” (2009), “Lola” (2009);. 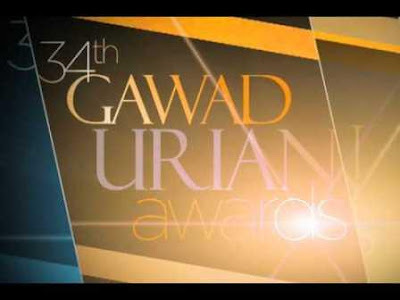 The awarding ceremony was held Tuesday night, May 17, 2011 at the Marriott Hotel in Resorts World Manila. Cesar Montano, Ai-Ai delas Alas and Butch Francisco served as hosts for this year’s ceremony.